Over 4 ounces of hand crafted in the USA silver. This piece has a cool Dual Link setup, that implements a flat link and two bridging oval links to make up the chain. 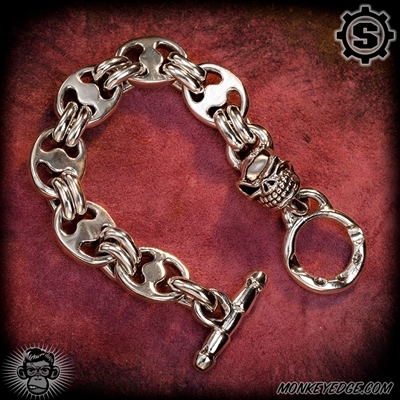 Of course the iconic Slickster head link is near the closure so you know your are rolling the S-Gear! Bracelet measures 8.5 in long from tip to tip. Will fit up to a 7.5-7.75 inch wrist depending on how tight you like to wear your gear.